One of the most important source of renewable energy is the sun and it is increasing its importance as alternative to the carbon fossil conventional source. This kind of plant is the most famous: main components of PV plant are the solar cells. 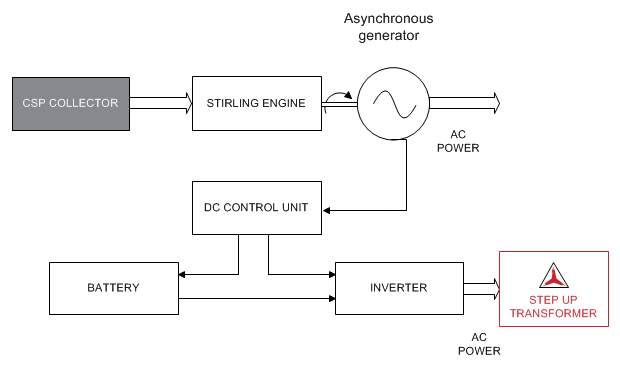 They produce directly DC current collected to an inverter that converts DC into AC to a distribution or converter high efficiency step-up transformer that transmits the medium voltage up to 36 kV to the network. Outdoor or indoor and multiple windings transformers are used for connection when more inverters are installed. In the CSP are used mirrors or lenses to concentrate sunlight in one point with the purpose to bring the fluid to high temperatures (approximately 600 °C). By this way is created heat that powers a steam turbine connected to a generator that produces electricity. Electrical energy in CSP plants is produced indirectly from the solar source instead in the PV plants is the opposite. Step-up medium power transformers are suitable for CSP plants to increase the voltage to the grid transmission levels. Operating temperatures and environmental conditions are two factors that influence the design of this kind of transformers: they has to be suitable for hard weather conditions and high temperatures. High efficiency compact solutions both for cast resin or liquid filled transformers. SEA made several tests to the fluids used in liquid immersed transformers to ensure the better cooling capacity. Optimal design thanks to finite element analysis and special test performed to check impact of harmonics on the materials allow to obtain structural and thermal performance suitable for this kind of application. Reliable and modern executions are obtained by SEA technicians' experience and advanced winding machines.